Keychain-sized UV scorpion detection. Photon's "Scorpion Finder" is a customized black Photon Freedom Micro with a purple 'blacklight' beam, a matching black anodized quick-release keyring, and featuring the "Scorpion Finder" logo on the back. The deserts of Iraq and Afghanistan are home to a number of different species of scorpions, many of which are highly toxic and pose a very real medical risk to humans stung by the scorpion. 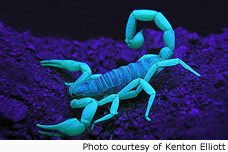 In fact, Iraq's "Death Stalker" Scorpion has one of the most toxic scorpion stings on earth. One unique feature of nearly all scorpions however, is that their bodies will fluoresce brightly under any UV light, which makes Photon's keychain-sized 'Scorpion Finder' perfect for sweeping dark rooms in the middle of the night to check for scorpions before climbing into bed, putting on boots, going to the bathroom, taking a shower, or just reaching into dark places. The Photon 'Scorpion Finder' is so small it can easily be carried at all times, to always be close at hand when needed. The light features a custom black quick-release keyring for easy attachment to gear. The body of the light is water resistant so it can even be worn in the shower.